I can barely remember the first time I proudly made ice cream as a 12 year old. I had a recipe book from a friend, it's tired pages were slightly torn, the writings in black and had no pictures. I made the ice cream mixture and left it in the freezer to come back to it later for further mixing. I was easily distracted and didn't know how quickly it can freeze. When I opened the freezer door, low and behold, I found the mixture turned into a hard block of yellow ice! It was of course on the same very hot day when Dade-Bajee (my grandmother) dropped by our place on her way home from her shali-zar (rice field). Oddly enough she went directly for the Yakhchal (refrigerator) door to grab something to cool her down. I can now imagine how difficult it was for a grandmother to work in the middle of summer harvesting rice. Although, it was magical at times to drop by as a child and see how the crop progressed or to have fun planting rice into the muddy watery soil but there was no magic for the adults. Not long before the grandparents decided to go into rice farming, Agha Joon (my grandfather) lost his job when the effects of the 1979 Islamic revolution hit the citizens of Iran hard. As we saw the gradual changes during the interim military government, we knew what the consequences of the Islamic revolution would be. I was in grade 4 and my brother in grade 1, and we all lived through the most worrisome times of our lives without any stability. One day, there was shortage of bread and the next day shortage of fuel and the story would go on and on. The most distressful outcome of the revolution was complete ignorance of the most basic human rights for non-Muslim citizens of that country despite the fact that to this day Iran remains a signatory to the United Nations Universal Declaration of Human Rights (UDH). As part of all of those changes, suddenly most adults in our family lost their jobs in government offices and institutions. Dade-Bajee was brave and despite her health and age decided rice farming was the way forward. I could clearly judge as a child that she needed something refreshingly cold to cool her and yes, Dade-Bajee found the best thing for herself; a stainless steel bowl full of custardy coloured ice frozen hard. She quickly grabbed it and looked quite pleased. Without paying any attention to what was going on around her she sat in the Birooni (outside sitting area) and started scrapping it's contents with a spoon and eating it. As soon as she came in, I started to think about how angry she must be that mum left me alone at home. So, I quickly started to explain before she asked but she showed no interest. By the time I stopped talking, the bowl was licked clean, and she got up to leave. Persians know how to indulge when it comes to food and were quite adventurous with creating new foods. 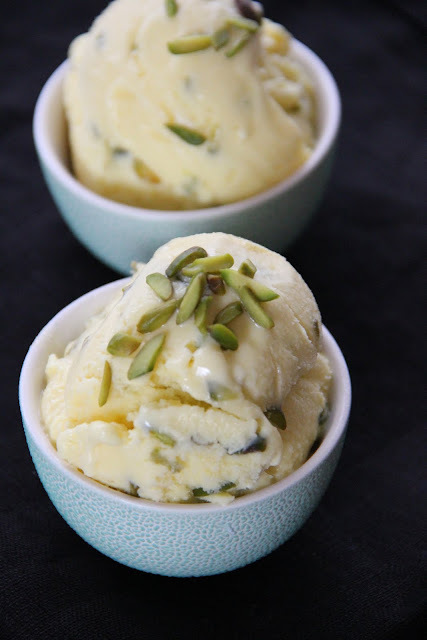 The story of Persians inventing, ice cream sounds like a servant got very drunk and poured a little Shiraz on snow covered footpaths and decided to serve it to his King who was also quite drunk. That little incident happened around 400 B.C. and later with the invention of yakhchal (basements used as chillers) in winter months the snow was stored for use during warmer days. Seriously, who would have thought that Persians can put Granita (the Italian iced treat) under their belts. Of course, a little later on came the invention of Faloodeh which is vermicelli noodles served with crushed ice and flavoured with rose water and fruit syrups as sweetener. However, Europeans perhaps had better ideas and they used dairy (milk and cream) as a creamy base for ice cream. The shah and royalties always brought back what they enjoyed during their trips to the West and ice cream was one of those souvenirs. Mozaffaroddin shah was the first person to bring it back to Iran and to establish an ice cream factory in his palace. Akbar Mashti, who opened the first ice cream shop in Iran, is also the inventor of the most preferred ice cream flavour combination for Persians; rose water, pistachio and saffron. He was a true marketing genius, if you ask me, he played it safe and simple, and his creation became famous as "Bastani-e-Akbar-Mashti". Bastani-noony (ice cream sandwich) is a very popular way of eating ice cream in Iran. Combine egg yolks and sugar in a heat-resistant bowl. Place over a saucepan of simmering water and whisk constantly with a whisk or electric hand beaters for 5-8 minutes or until the mixture is thick and pale and a ribbon trail forms when the whisk or beaters are lifted. Remove the mixture from the heat, add rosewtare and saffron and whisk until cooled to room temperature (the mixture will thicken further as it cools). Whisk the cream in a medium mixing bowl with a whisk or electric hand beaters until soft peaks form. Stir the milk into the egg yolk mixture until well combined. Fold half the cream into the egg yolk mixture with a large metal spoon or spatula until almost combined. Add the remaining cream and fold gently until thoroughly combined. Add pistachios and fold gently. Pour the ice-cream mixture into an airtight container and seal. Place into the freezer and freeze for 8-10 hours or until firm. Store in the freezer for up to 1 month. About 20 minutes before serving, transfer the ice-cream to the fridge to allow it to soften slightly. Serve as desired. Place the ice cream mixture in a stainless steel bowl and put in the freezer. 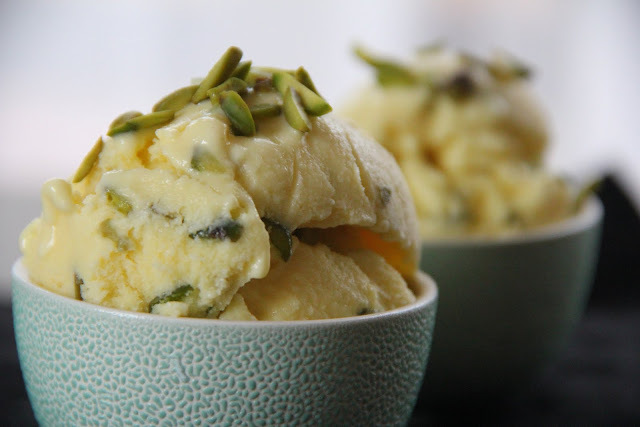 When it becomes partially frozen, that is , the sides and bottom are almost firm and the middle is still liquid, take out the ice cream and , using a whisk, beat the mixture vigorously to incorporate air and break up the ice crystals, until it becomes creamy. Return the bowl to the freezer and repeat the process 4 to 5 times more, beating vigorously each time. Lastly, transfer the ice cream to a freezer- proof container, cover and freeze until ready to serve. Or simply, place the mix in an ice cream maker bowl and follow the manufacturer's instructions. من و دوستانم در نمایشگاه پکن غرفه ای برای معرفی ایران داریم.